One of the biggest hurdles in combating mesothelioma cancer has been an inability to accurately diagnose the disease early enough to treat it effectively. Far too often, mesothelioma is not identified until it has metastasized, leading to a typically poor prognosis. Help may be coming in the future. Researchers in Zurich, Switzerland recently published a study involving new technology that may help detect mesothelioma much earlier than before with a simple, noninvasive blood test. Bernd Wollscheid, Ph.D., of the Institute of Molecular Systems Biology and lead researcher of the study, says the findings could become a significant step toward more effective management of the disease in the future. The research involves Selected Reaction Monitoring (SRM) technology that can uncover newly identified, protein-derived biomarkers that tumor cells have released into the circulatory system. most commonly used biomarker that has only limited diagnostic value for mesothelioma. By identifying a panel of biomarkers instead of just one, researchers expect the new tool will be a more accurate indicator of the disease. “Our study shows that SRM assay technology enables the direct clinical evaluation of protein-derived candidate biomarker panels for which clinically reliable (testing methods) currently do not exist,” wrote the authors of the study, which was published last month in Clinical Proteomics Journal. between exposure and definitive diagnosis. Symptoms often mirror those of less serious problems, and often don’t appear until decades after an inhalation or ingestion of microscopic asbestos fibers. They can be as simple as a dry cough, shortness of breath, or night sweats, and excess fluid around the lungs. 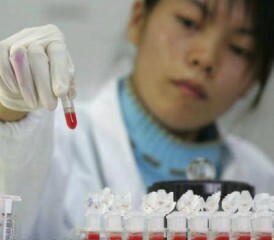 The new blood test could simplify the process and lead to a much earlier diagnosis. There are other blood tests currently being used for mesothelioma, but with limited success. The most well-known one is the MESOMARK test, which involves measuring the biomarker mesothelin. Although MESOMARK is FDA approved, it has been more effective in measuring the progression of mesothelioma that already has been diagnosed, rather than the early presence of mesothelioma. Wollscheid believes the value of the recent findings will be in an ability to easily test high-risk patients (those who worked with asbestos) in order to diagnosis it before it has spread, or even developed fully. It could change the way it is treated. This recent study was done collectively by scientists from the U.S., Sweden, Chile, Italy and Switzerland. According to an unrelated study recently done in Germany, advancements in Nanotechnology – the manipulation of matter on a molecular scale – is another path toward significant future help toward mesothelioma diagnostics. Researchers from the West German Lung Center at the University Duisburg-Essen worked with a CytoViva Hyperspectral Imaging System, which evolved from technology originally developed for NASA, to create high-contrast images of tissue samples. The system was programed on a microscopic level to recognize the fingerprint of diseased lung tissue. The intent is a much less invasive procedure to identify mesothelioma and lung cancer with a simple test. Wollscheid, Bernd, Ph.D., Institute of Molecular Systems Biology, Zurich, Switzerland, interview with Asbestos.com. (2013, Dec. 6).